The sea of protests against President Garcia continues into its twelfth day. Garcia, who won the election last year on an anti-Chavez platform has ordered a wave of repression to put down the protesters. Police are conducting mass arrests and at least four activists have been killed including a local peasant leader who was shot dead by police on Monday. Protesters are angry that whilst the economy is growing the poorest half of the population have seen no benefit, still putting up with dirty water and food and electricity shortages. Ernesto Velit, a political analyst told Reuters "What we have in Peru is economic growth without social development". The protests began as a strike by teachers union Sutep against an upcoming education bill which, they claimed, would be a charter for the arbitrary sacking of teachers. Negotiations failed when the President insulted the union and denounced teachers as "left wing radicals". The teachers were quickly joined by workers from other industries including miners, transportation workers, farmers and construction workers. Every town and city of Peru has seen large scale protests and battles with the police over the last two weeks. As things stand at the moment the authorities have locked up over a hundred and fifty union officials (the Interior Ministry claims a total of 298 arrests so far). 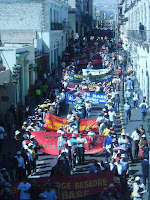 Francisco Soberón, President of a Peruvian human rights association, APRODEH, condemned the detention of trade unionists without charges and on no evidence. Leading opposition politicans have joined the street protests and some groups have offered the government a 48 hour truce although how much sway these groups have and whether the government will take them up on the offer it's to early to tell.